Little House Home Arts: A Quiet Time, a Welcome Change! It has been a quiet time at Little House, a most welcome change! No parties or gatherings and with the help of my two hour monthly house cleaners' help, there is peace and order once again, at least for a short time. 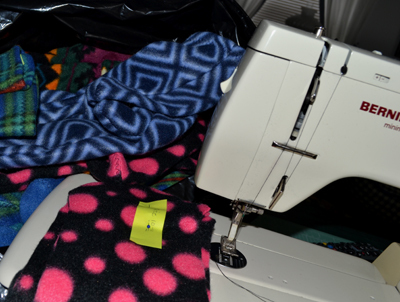 It is obvious that there is industry waiting to come back out, temporarily stored in stacks all over my dining room, where sewing, not dining, happens! A quilt-as-you-go quilt. Two seams and binding and it will be done! I am continuing to do the several-ring modus operandi that I ascribed to some time ago. A bit of progress on various projects: my first machine quilt waiting for the last two seams and binding to be completed along with my latest machine-quilted combination quilt/comforter for our guest bedroom waiting to be laid out for tying; my perpetual fleece sock production; as well as a similar on-going pincushion and craft production for my fall and winter sales. A quilt-as-you-go quilted top,waiting for another batting and backing. Sit with nothing to do?...Think again! There are fleece socks to be sewn!! And projects to be finished for sale in the fall! 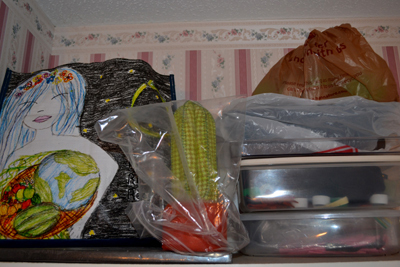 Flower pot pincushions in bag waiting to be finished, & cat nip mice to sew. I take time to read my latest kindle books, and per my modus operandi, never just one at a time. I am currently reading The Freemasons, History of the World's Most Powerful Secret Society by Jasper Ridley to better understand some of my ancestors and their thinking, though it really seems to be more about the history of clashes of beliefs throughout the ages and how intolerant different groups were of each other. Horrible tortures were all done in defense of their beliefs: disemboweling, lopping-off of hands and body parts and stretching racks to eliminate evil thinking--really? But watching the 2016 election process on TV, why am I surprised? Another book seemed to be more entertaining. What I thought was to be a rather light-hearted novel regarding a couple going through a mid-life crisis after their children leave home, turned into a very involved twisted plot about the husband's new girlfriend stalking the entire family and plotting a series of mysterious revenges for past secrets. What was it about the title that left me to believe it would be a sweet-sort-of-book at all? Don't miss The Betrayal, A Gripping Novel of Psychological Suspense by Laura Elliot! I have also taken on the reading of a rather massive encyclopedia sort-of-book about Chinese medicine applied to nutrition, Healing with Whole Foods by Paul Pitchford. The yin and the yang in the world of food is a very interesting concept. Achieving balance in one's body by using various foods, is actually a fascinating read, as it isn't about using our American style of balancing meals using the food pyramid at all, though I remain hopeful that it is about keeping the sweet as well as the sour in my diet? I like the idea that extremes are NOT the goal of any nutritious diet, though sprouts aren't my idea of being the sort of sweet to replace pies and cookies!? It is a slow and relaxing time, not unlike watching grass greening up in spring, which is also happening here in Vermont, though temporarily paused when the green turned to white, getting more snow than we had all winter!! Of course winter isn't ready to leave just as we were beginning to throw open our windows for fresh air as well as for the purpose of listening to the peepers singing to us at night! I think they have tucked back into hibernation until it warms again, which hopefully won't be long now! 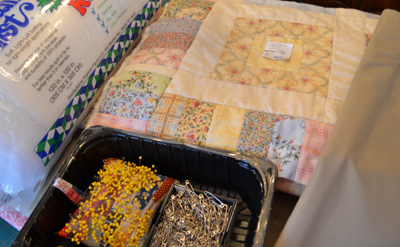 Our local Maple Leaf Quilt Show was this last weekend in Rutland, Vermont. It is only held now every two years. Their money-making "Consignment Sale" is one of my favorite events. 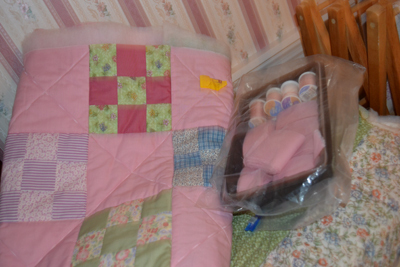 Quilters thin out their sewing rooms and sell off whatever they don't feel like keeping and great buys are abundant! Never mind that I should be hanging a sale sign outside my house and inviting people in to browse and shop my sewing rooms that are bursting at the seams with all sorts of sewing stuffs that I think will take three lifetimes to use! Instead I am out shopping for more? 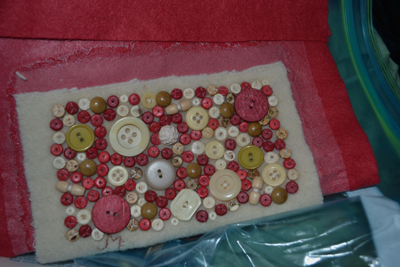 Pinned and ready for tying: a machine- quilted top with batting and backing. Meanwhile, my quilted quilt top is laid out with its backing as well as another layer of batting to prepare it for tying. 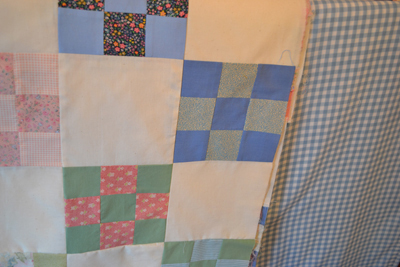 I am trying a new style of Quilt-as-You-Go Quilting with using a whole-piece backing. 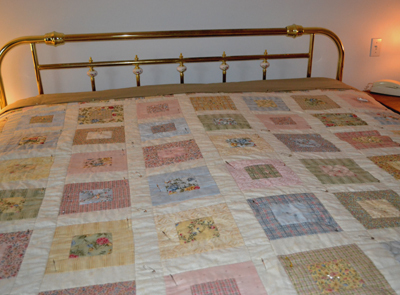 If this method works, I am will be doing another quilt for my girlfriend in this same manner. Nothing like a systematic trial-and error method of learning! Simple 9 patch/9 patch top and backing, waiting for the best quilting method. It is nice to be pressure-free with no imminent deadlines approaching, though what gets done now will prevent the angst of last minute pressures before my sales in the fall. Peace and quiet is a welcome change and I am taking a moment to enjoy it!